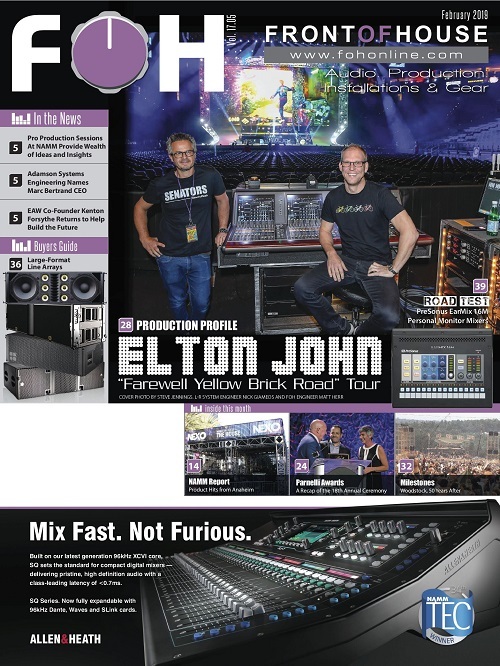 FRONT of HOUSE contributor Steve La Cerra reports on the highlights of the recent AES Show for this Show Report. His “On the Digital Edge” column will return in Dec. 2018. Meanwhile, FRONT of HOUSE staff also checked in on the concurrent LDI show in Las Vegas. —ed. 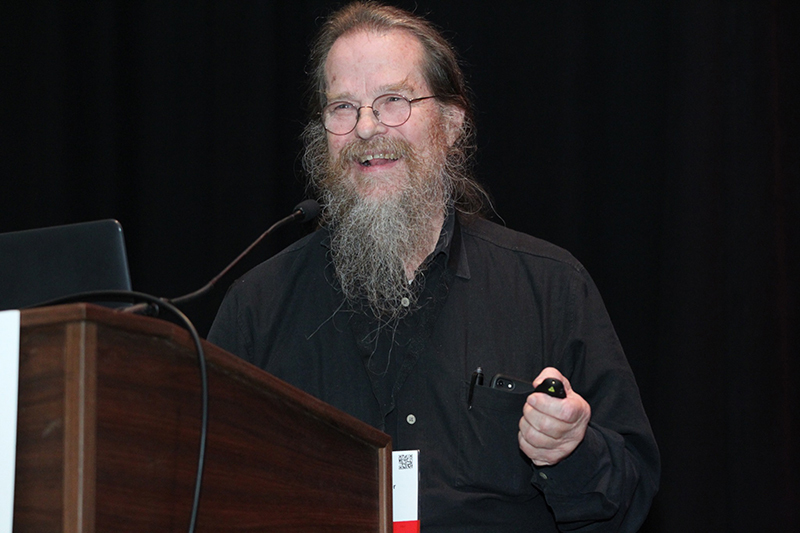 Flying under the banner “Connect,” the 145th Convention of the Audio Engineering Society in New York (Oct. 17-20, 2018) delivered plenty in the way of connection — not just in terms of audio, but also by providing a cast of industry notable presenters including keynote speaker Thomas Dolby, Bob McCarthy, John Storyk, George Massenburg, Steve Remote and Dave Natale. 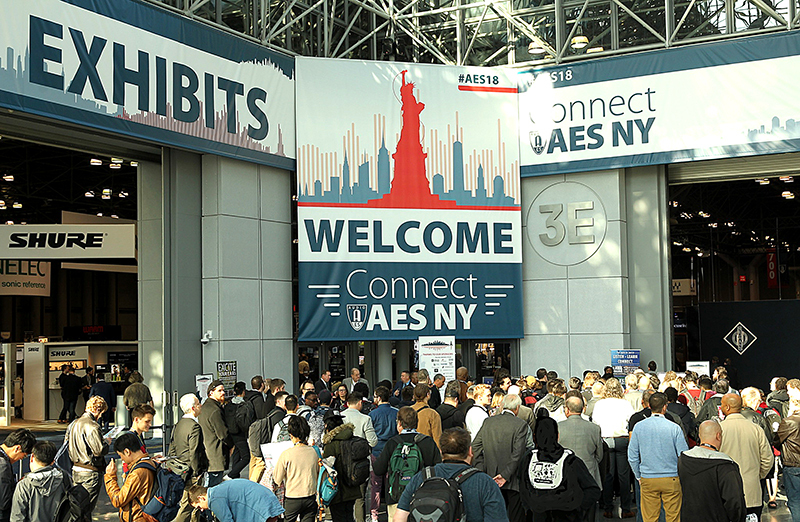 Nearly 14,000 registrants kept the AES New York 2018 exhibition floor bustling, bolstered by attendees from the co-located NAB New York show. Besides seasoned pros, attendees included a healthy contingent of students from across the country. One instructor I spoke with drove in a straight shot with a colleague and ten students from a college in Ohio to attend the show in NYC. Student events — such as “Making Live Jazz Sound Like Live Jazz,” the Saul Walker Student Design Competition and educational and career fairs — made it worth their while. The three-day gear expo showed the latest innovations from over 300 brands, including 37 new exhibitors — some returning after periods of absence to embrace the renewed enthusiasm of show attendees. Technically speaking, there were two things worth noting: (1) just about any device that had either an onboard A/D or D/A converter also had a network port; and (2) there was a lot of discussion of immersive audio, including demos by Genelec and L-Acoustics. Immersive is gaining popularity in VR, high-end gaming applications, live sound and even mobile devices. As you’d expect, there were plenty of product announcements. Here are a few of the highlights. 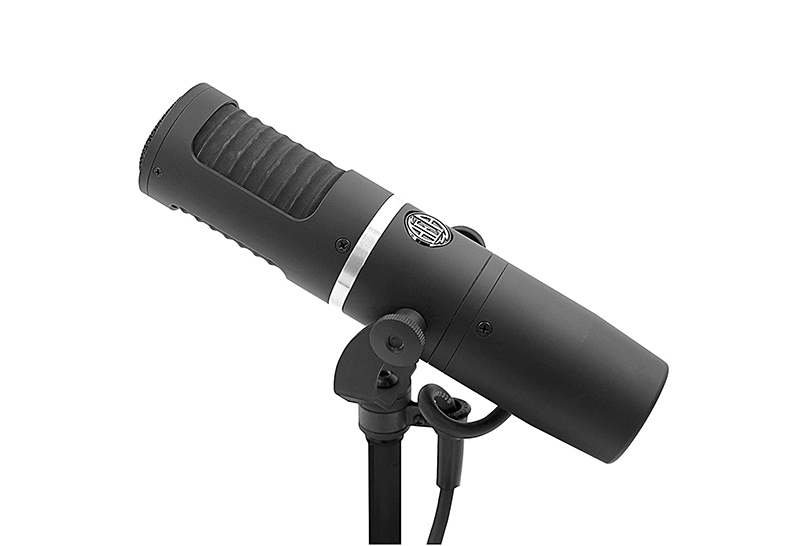 AEA (www.aearibbonmics.com) launched the KU5A, its most affordable and durable ribbon mic ever. Designed for studio or live sound, KU5A is an end-address ribbon design with a supercardioid pattern and a switchable high-pass filter to tame proximity effects. Onboard phantom-powered electronics (JFET with custom transformer) boost the output for use with virtually any console and the mic handles 135 dB SPLs. An integrated windscreen tames breath pops and wind noise. Street is $999. 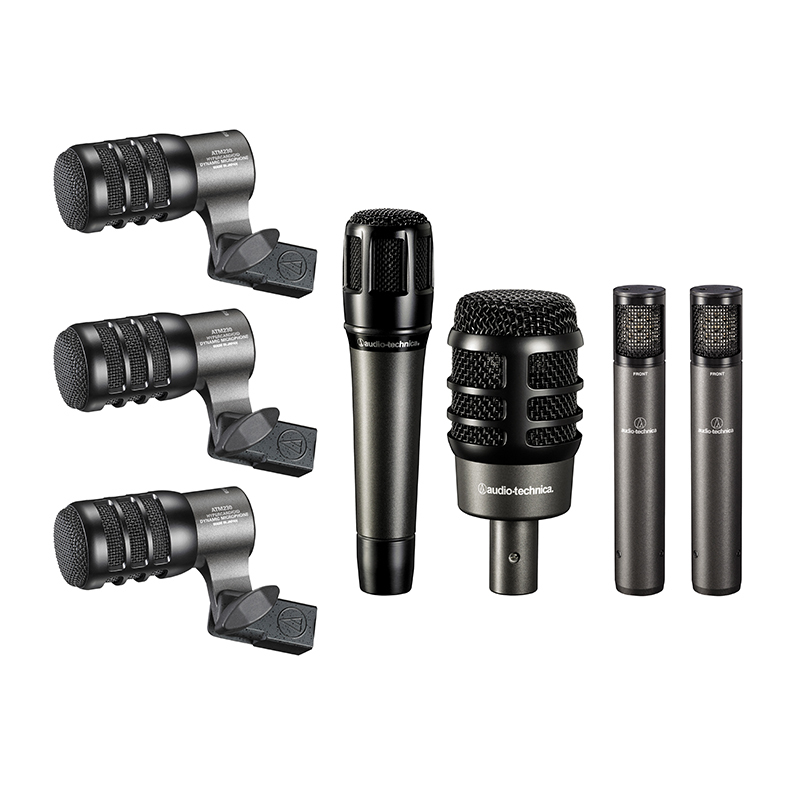 Audio-Technica (audio-technica.com) offers new mic bundles. The ATM510PK includes three ATHM510 dynamic vocal handhelds, all with rare-earth magnets for increased output and improved transients. The basic PRO-DRUM4 mic pack incorporates a PRO 25ax kick mic, a PRO 63 snare mic and two PRO 23 tom mics. The PRO-DRUM7 package adds another PRO 23 tom mic and a pair of AT2021 condensers. Aimed at pro users, the ATM-DRUM4 and ATM-DRUM7 packs include a ATM250 kick mic, ATM650 snare mic and two ATM450 cardioid overhead mics; the ATM-DRUM7 adds three ATM230 tom mics. 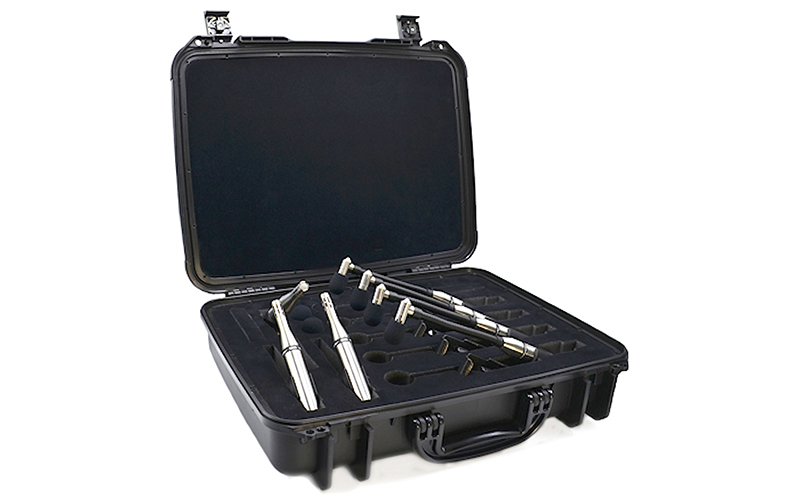 All of the bundles include specific clamps for each micro and a hard carry case. Pricing is significantly discounted over items purchased separately. Earthworks’ (earthworksaudio.com) DK7 Drum Kit System is has four DM20 DrumMics, four RM1 RimMounts, two SR25 overhead mics, one SR20LS mic, three mic clips and a carry case. Designed for close-miking toms/snare, the DM20s feature a gooseneck for easy positioning. 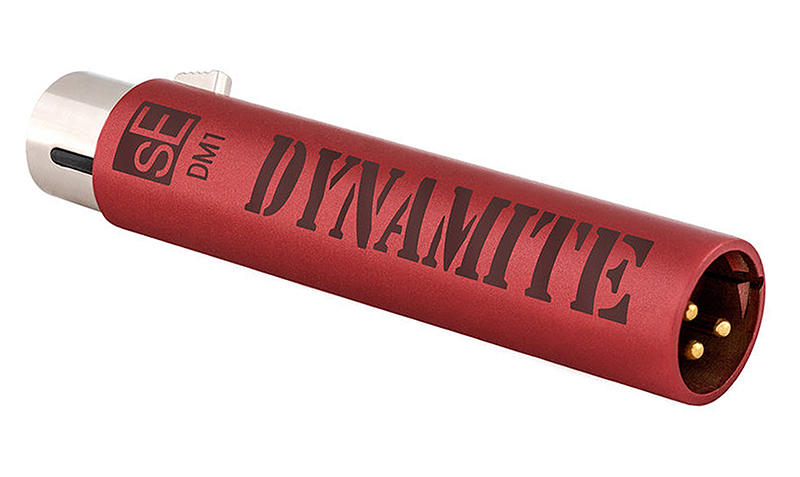 The SR20LS (Low Sensitivity) kick mic handles 150 dB SPLs with a fast impulse response. sE Electronics (seelectronics.com) showed its $99 DM1, an active inline preamp/booster that plugs between your mic and mic pre, providing +28 dB of clean, transparent gain for passive (dynamic or ribbon) mics. Besides boosting low-output mics, the phantom-powered DM1 can drive long cable runs, while reducing susceptibility to RF interference, buzz and hum. 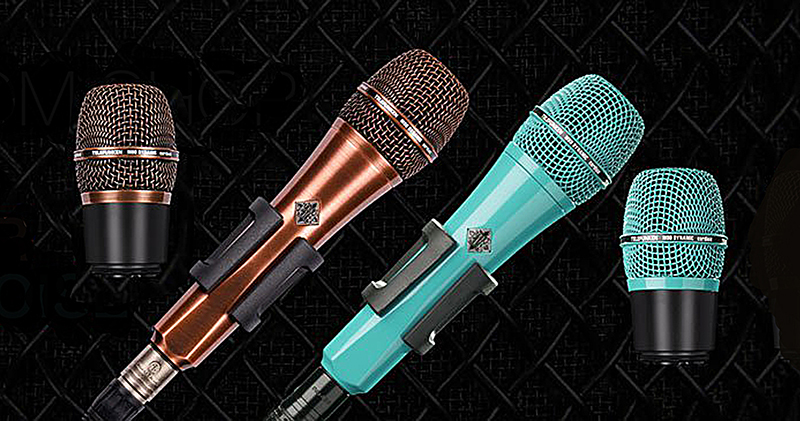 Telefunken (telefunken-elektroakustik.com) expanded color options for its M80 and M81 dynamic handhelds — as well as the M80-WH and M81-WH wireless mic heads — now in copper and turquoise finishes. Additionally, the M80-WHN and M81-WHN heads that mate with Shure-brand ULXD2/KSM9 transmitters are also now offered in a brushed nickel finish. 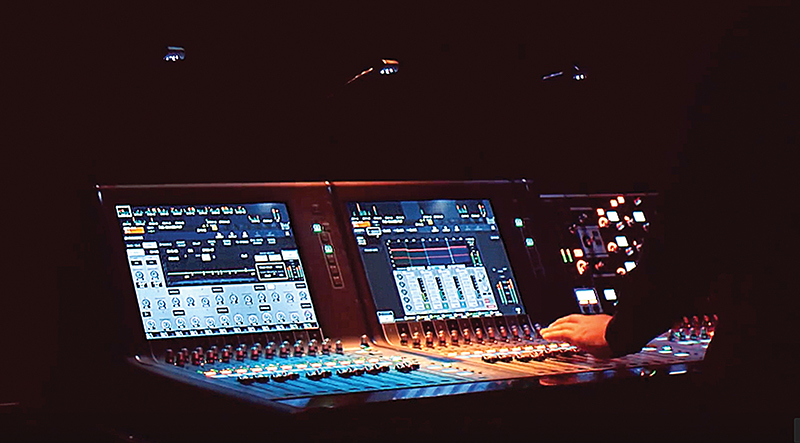 Allen & Heath (www.allen-heath.com) unveiled enhancements for using its SQ mixers in monitor applications. Free SQ V1.3 firmware adds a listen bus for patching PAFL to an IEM system, stereo nearfield monitors or a mono listen wedge; and an External Input to PAFL function to simplify communication between FOH and monitors. V1.3 firmware also dovetails with the new SLink card (which adds an additional 128 inputs and 128 outputs), opening up new possibilities for FOH/monitor splits and remote I/O, or combinations of either of these with a ME personal monitoring system. Digital splits are eased by new Tie Lines that connect input and output sockets without running through SQ’s processing. The companion V1.3 SQ MixPad app also adds new features, including FX and DEEP unit control, a patching matrix, plus integration with the signal generator and user permissions. 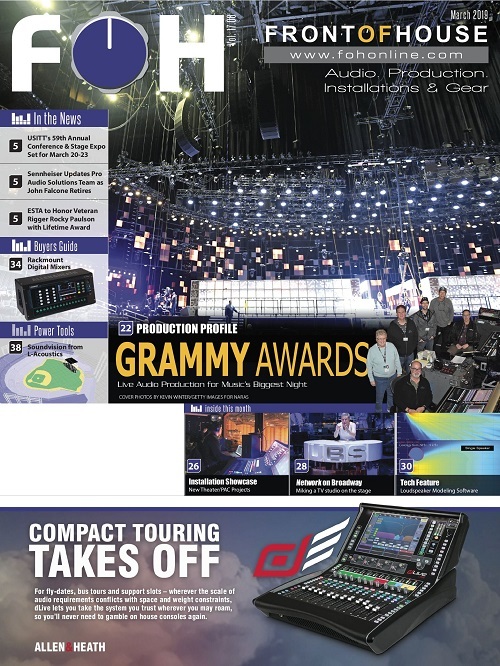 Avid (www.avid.com) is now shipping some of the components announced earlier this year for its expanded VENUE S6L unified live sound platform, including the compact 24-fader VENUE S6L-24C control surface, VENUE E6L-112 processing engine and Stage 32 I/O rack option. Speaking of Avid, L-Acoustics’ (l-acoustics.com) new L-ISA Source Control plug-in for the S6L mixer provides convenient access to all “source object” controls in the immersive audio environment, including pan, width, distance and elevation and a designated aux send. All L-ISA parameters can be stored in the console’s snapshots engine for recall. DiGiCo (digico.biz) has been busy, showing the new Stadius 32-bit D/A converter card, which complements its well-received 32-bit John Stadius mic preamp cards. The 32-bit D/A uses ultra-low noise linear power supplies for a noise level of -100 dBA and a dynamic range of 122 dB. Frequency response is stated as 20 Hz to 44.5 kHz, ±0.15 dB. The Quantum 7 engine for DiGiCo’s SD7 uses three Super FPGA processing devices to expand the console’s capabilities to more than 640 channels at 96 kHz. An SD7 Quantum offers 256 inputs, 128 aux/subgroup buses, 48×48 matrix, 688 dynamic EQs and multiband compressors and 48 digital effects. I/O channel processing includes delay, DiGiTuBe, dual insert points, high/low-pass filters, 4-band PEQ (8-band on output paths), DYN 1/DYN 2 dynamics suites. Connectivity includes 12 analog and 12 AES I/Os, an Optocore fiber loop for 504 audio channels and a 48-channel MADI interface. 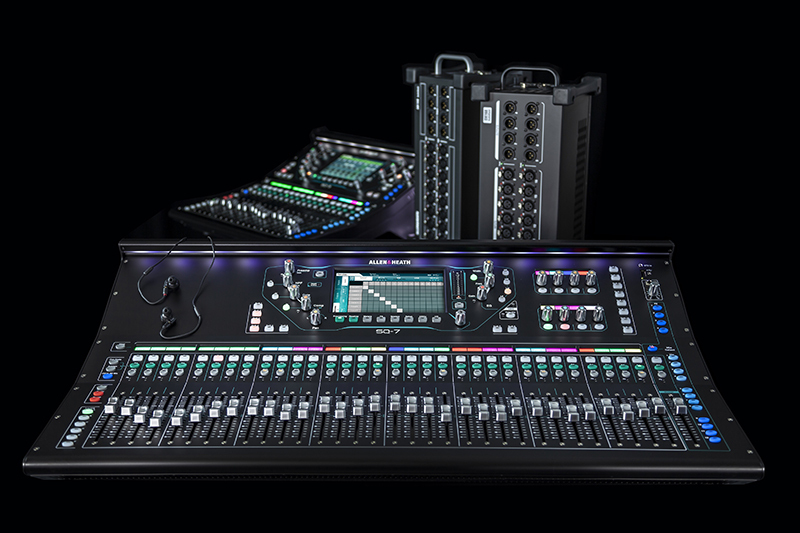 And DiGiCo’s S-Series consoles weren’t left out, with a new DMI-AMM card that allows up to 48 channels of automatic mic mixing on any DiGiCo S-Series board. It seamlessly incorporates into the S-Series user interface, for a continuous workflow that does not hinder the console operation. Hear Technologies (www.heartechnologies.com) is shipping its Hear Back OCTO personal monitor mix system, based on new compact mix surfaces (8 mono channels — up to 4 stereo pairs, plus a stereo aux input) and offering improved audio quality and ease of use. Systems are expandable to almost unlimited size and connect via standard Cat-5 cabling for power and audio. 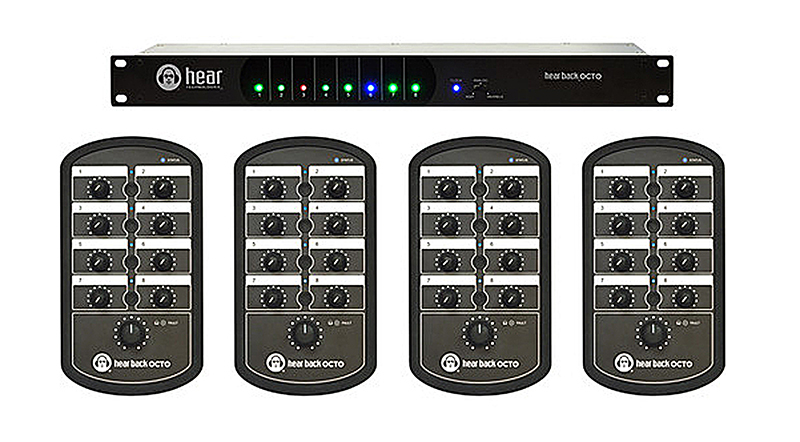 Also new is a V5 firmware update for Hear Back PRO, enabling routing and submixing of up to 128 channels. The musician or engineer can quickly build a submix of up to 16 channels by adjusting the levels, pan and stereo width. Tascam’ss (www.tascam.com) Model 24 is a 24-channel analog mixer with integrated multi-track recording. Features include 16 high-quality mic preamps, four stereo line inputs, three-band EQ with mid-sweep, three aux sends, 100mm faders and built-in effects. 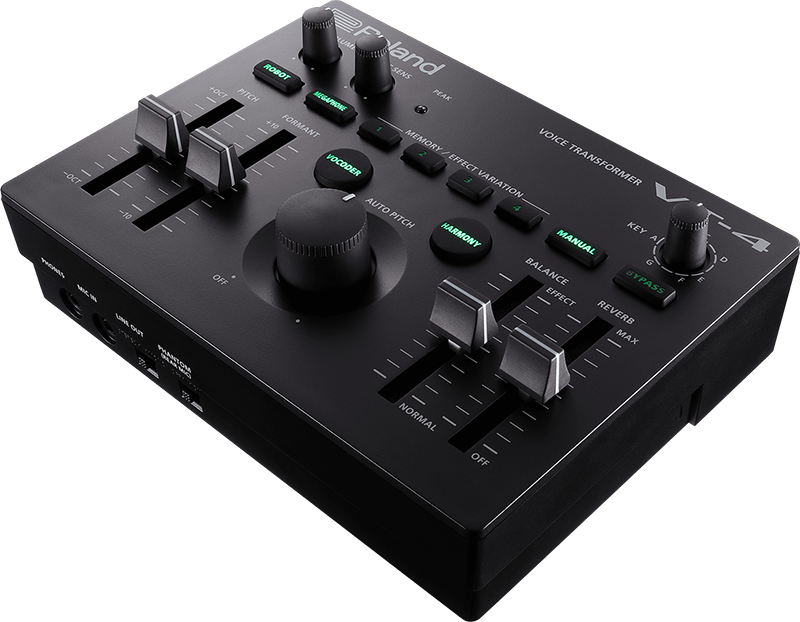 The onboard supports 24-channel recording to SD, SDHC and SDXC cards (WAV, 48kHz/24-bit), and its USB interface enables transfer of audio data to/from a DAW. Waves (waves.com) announced three new SoundGrid servers: SoundGrid Extreme Server-C, SoundGrid Server One-C and SoundGrid Mobile Server. All three units feature powerful DSP for running high plug-in counts, and latency as low as 0.8 milliseconds at 44.1/48/88.2/96 kHz. 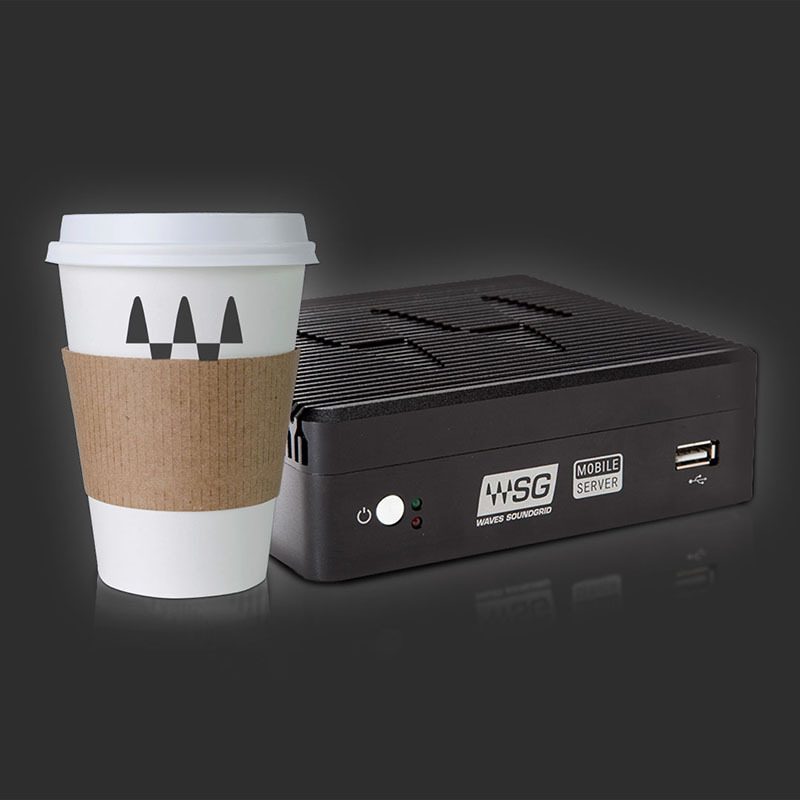 SoundGrid servers can be used with any SoundGrid I/O interface (including DiGiGrid I/Os), or with non-SoundGrid I/Os (ASIO/Core Audio) via SoundGrid Connect. Yamaha (http://usa.yamaha.com) unveiled Rivage PM Series Firmware Version 2.5, an update that includes a new Theatre Mode to facilitate scene and costume changes with four banks for different EQ and dynamics settings for individual performers. V2.5 also supports Audinate’s Dante Domain Manager. Lectrosonics’ (www.lectrosonics.com) RPS4 is a universal DC supply with redundant internal power modules offering a 12 VDC source for devices such as wireless mic receivers, IEM transmitters and audio processing gear. The unit eliminates the need for a separate power strip with individual DC supplies for each device. Its four outputs have locking (LZR type) taps, each supplying up to 1.5 Amps. It’s shipping now at $2,290. 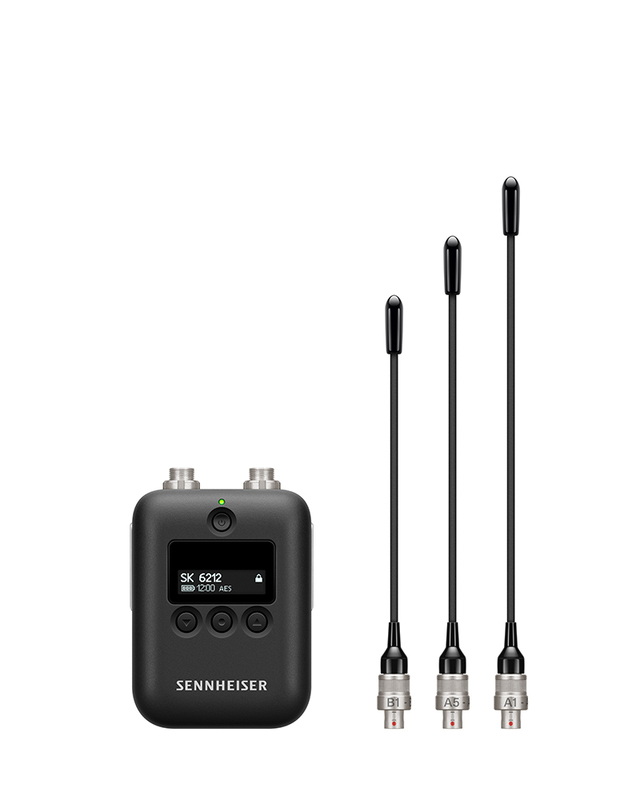 Sennheiser (sennheiserusa.com) launched its SK 6212 mini-bodypack transmitter for its Digital 6000 wireless system. The SK 6212’s compact chassis (2.5 x 1.8 x 0.8 inches) is just 112 grams, including a removable BA 62 lithium-polymer battery that’s said to run the pack up to 12 hours. Features include a detachable, field-replaceable antenna, IR-sync ability and a moisture-resistant design. The SK 6212’s DSP functions are located toward the front of the pack to reduce heat transfer when it’s placed next to the skin. The SK 6212 will ship in early 2019. Sennheiser and Neumann (neumann.com) jointly announced a special edition of the evolution ew 500 G4-KK205 wireless mic system to commemorate Neumann’s 90th anniversary. The system pairs a Sennheiser ew 500 G4 handheld with Neumann’s KK 205 true condenser capsule, and is offered only until the end of 2018. Neumann mic heads had previously been reserved for Sennheiser’s 2000, 6000 and 9000 wireless series. 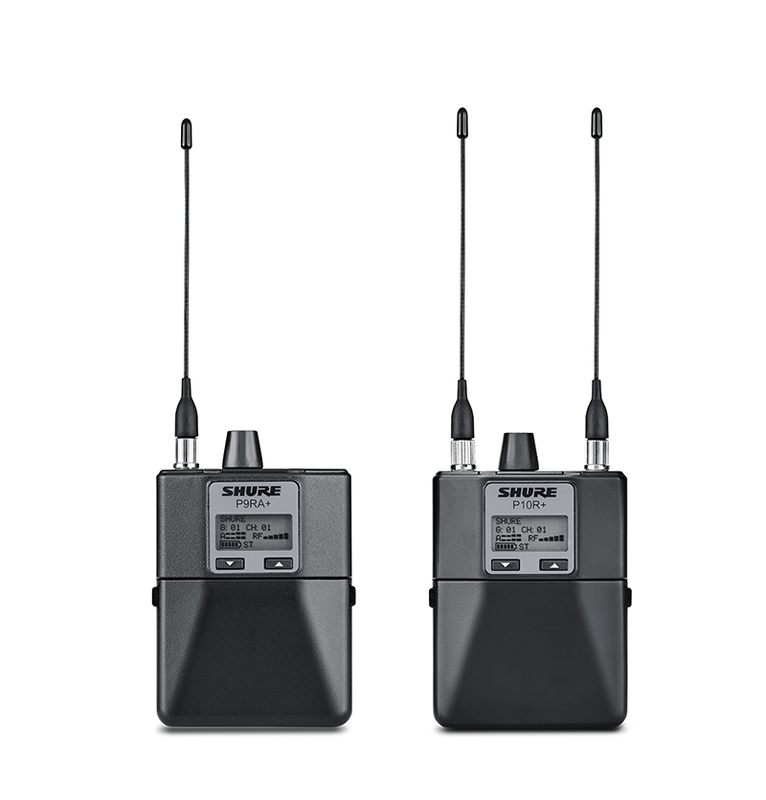 Shure (shure.com) unwrapped its ADX1M micro-bodypack for the Axient Digital wireless system. The ADX1M is housed in a durable Ultem PEI chassis measuring 2.7 x 2.4 x 0.7 inches. It provides two transmission modes: standard for optimal coverage and a high-density for max channel count. Shure ShowLink remote control enables real-time parameter adjustment and interference avoidance. Sealed buttons and a recessed Lemo connector protect against sweat/moisture; a rechargeable SB910M battery has up to seven hours of powering. Shure also demoed P9RA+ and P10RA+ bodypack receivers for its wireless IEM systems. Compatible with all Shure P9T and P10T transmitters, the P9RA+ uses hybrid analog/digital technology for increased headroom and improved stereo separation and RF strength. The P10R+ is a twin-antenna diversity bodypack for use with the PSM 1000 system and features full-bandwidth RF scan, precision front-end RF filtering and automatic RF gain control. 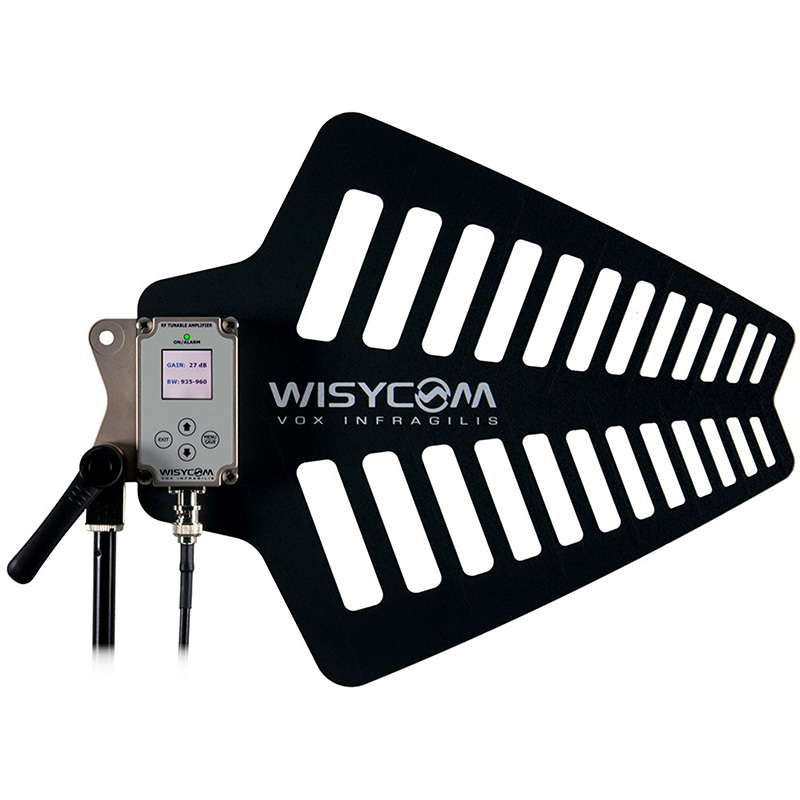 Wisycom (www.wisycomusa.com) showed the LFA Ultra-Wideband Active Antenna (LFA) that operates in the 410-1,300 MHz range and provides 7 dB of antenna gain, an adjustable onboard RF amp and three RF filters. The BFA-B/BFA-N Ultra-Wideband Booster (BFA) offers the same features as the LFA without the antenna element, for use as an in-line filter/booster solution with existing passive antennas. DirectOut’s (directout.eu) PRODIGY.MC is a modular audio converter/router with a variety of I/O, networked audio and control capabilities. Based on 8-channel modules, line-level, mic and AES3 interfaces can combine for up to 64 I/Os in intwo rackspaces. PRODIGY.MC hardware also supports MADI and a network audio option; an optional board adds Dante, RAVENNA (AES67) or SoundGrid connectivity. Neutrik’s (neutrik.com) NA2-IO-DLINE Dante interface was developed for connecting legacy gear to Dante networks. 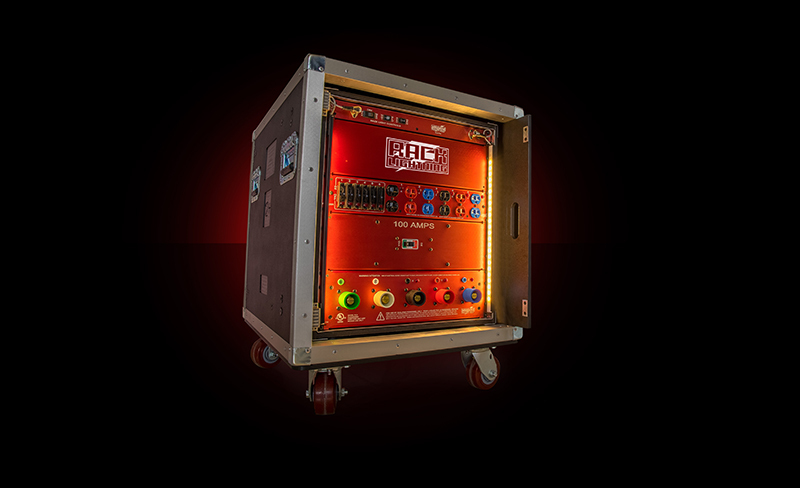 It’s an AES67-compliant breakout box with two channels of balanced XLR I/O and a Dante port, enabling analog gear to be routed into a Dante network while also converting a Dante stream to analog audio. The unit operates on Power over Ethernet (PoE). 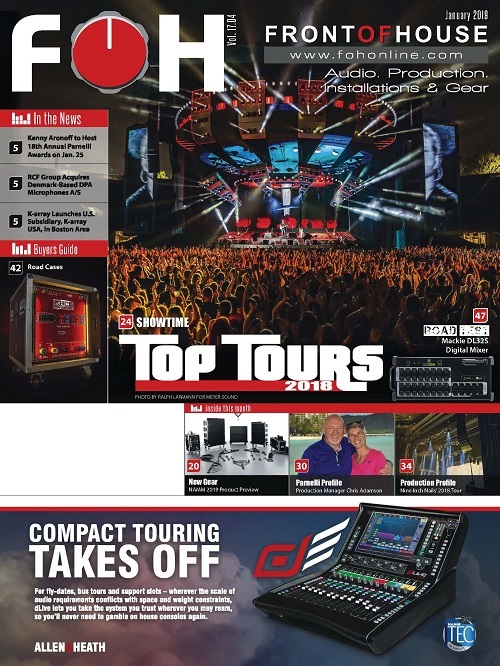 RME’s (www.rme-usa.com) M-32 AD Pro and M-32 DA Pro are 32-channel 192 kHz converters offering a 120 dBA signal-to-noise ratio with ultra low THD. Both units feature redundant power supplies, compact housings and network functionality. Along with two MADI I/Os with separate signal routing, an AVB interface enables sending 32 analog channels at 192 kHz over a single Ethernet cable. Combine with external AVB switches, and the units easily integrated into more complex network structures. RTW (www.rtw.com) is distributing Nixer Pro Audio and its handheld PD-Dante for monitoring/diagnosing Dante streams. 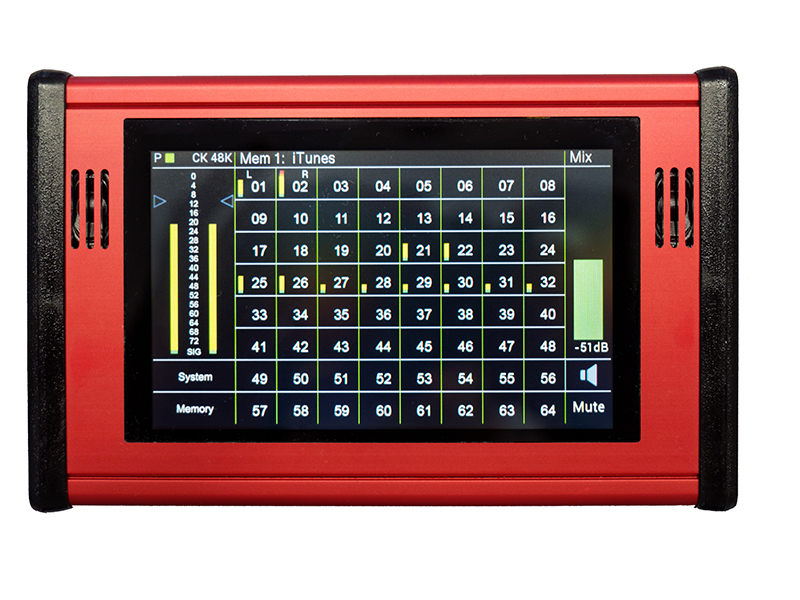 From a touchscreen, users select from an existing mix or create a user-defined mix of a Dante feed’s 64 channels and listen to them via onboard speakers or headphone output. Channels displayed on the main LCD show routing to the left/right outs, signal level meter, 0 dBFS peak indicator and channel name. PD-Dante also has a stereo AES/EBU input, stereo line in and mic input — all assignable to any Dante output channel. Sommer Cable (www.sommercable.com) displayed its SPY-EDA series of interfaces that add analog I/O to any Dante network. One/two/four-channel versions are available, all intended for integrating devices such as analog mixers, power amps or active loudspeakers with a Dante network. Features include locking Neutrik EtherCON connectors, metal chassis, and PoE (or a 5-volt adapter) operation. 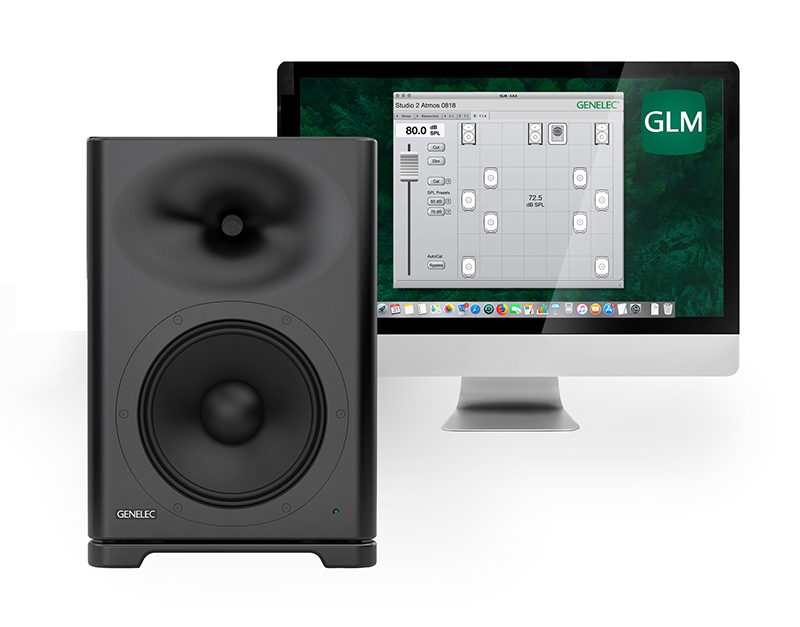 Genelec’s (genelec.com) S360A Smart Active Monitor is a two-way design with a 10-inch woofer and 1-inch exit HF compression driver that can produce 118 dB peak SPLs. A companion 7382 SAM Studio Subwoofer with three 15-inch woofers is also offered. The models are targeted for applications requiring high-SPL reproduction or distant listening, such as large immersive setups. We can easily see them being used as nearfield FOH monitors in a live production situation. Mackie (mackie.com) enters the pro headphone market with its MC-150 and MC-250 models featuring 50mm drivers in a closed-back design for isolation from external sound. The MC-150 is intended for studio and DJ use; the MC-250 is intended for critical monitoring applications such as mixing. 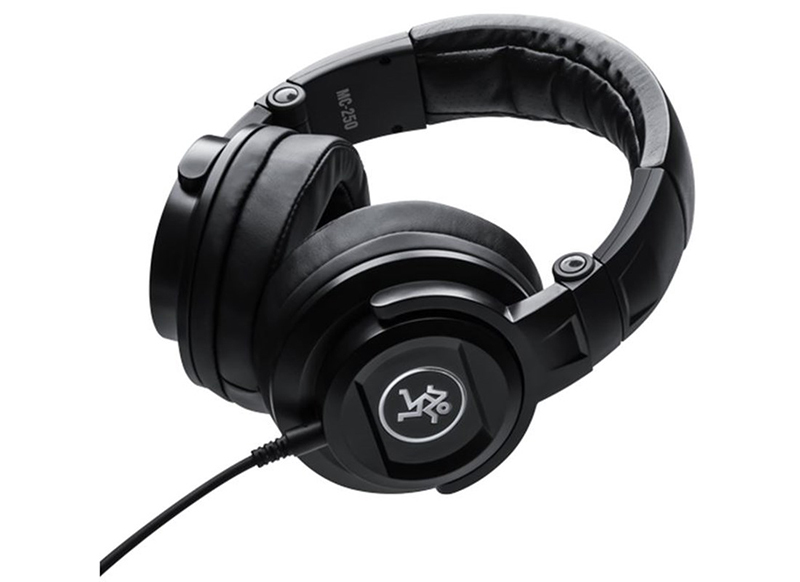 The MC-150 frequency response is 15 Hz to 20 kHz; the MC-250 is spec’d at 10 Hz to 20 kHz. Pliant Technologies (www.plianttechnologies.com) demoed v1.2 updates to its CrewCom wireless intercom system. The new firmware adds improved ease of system configuration, improved RF range, and enhanced audio quality. Roland’s VT-4 Voice Transformer (roland.com) is a really cool vocal effects processor tailored for live performance. It generates chorus, vocoder, harmony, delay, reverb, pitch-shift and auto-tuning effects. MIDI control of auto-pitch and vocoder functions is available in real-time, and the VT-4 can create multiple harmonies based upon MIDI input. Effect chains can be saved/recalled and a compact console-type package facilitates onstage use. 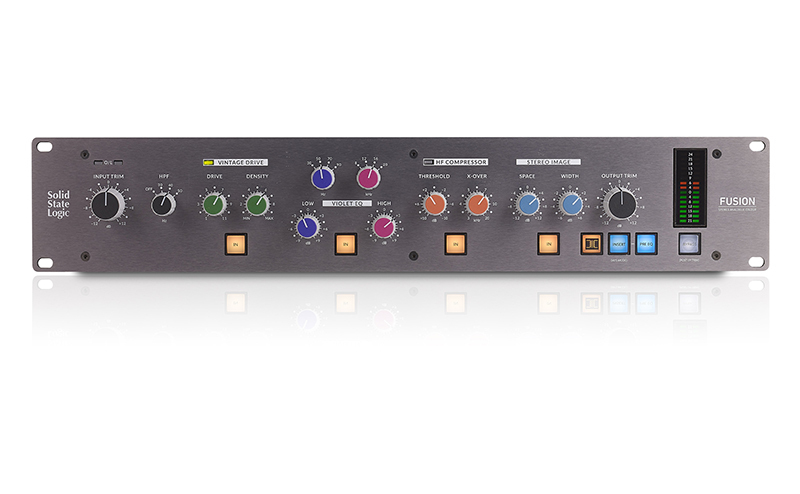 Solid State Logic’s (www.solidstatelogic.com) Fusion is an analog stereo EQ/coloration processor priced at $2,499. 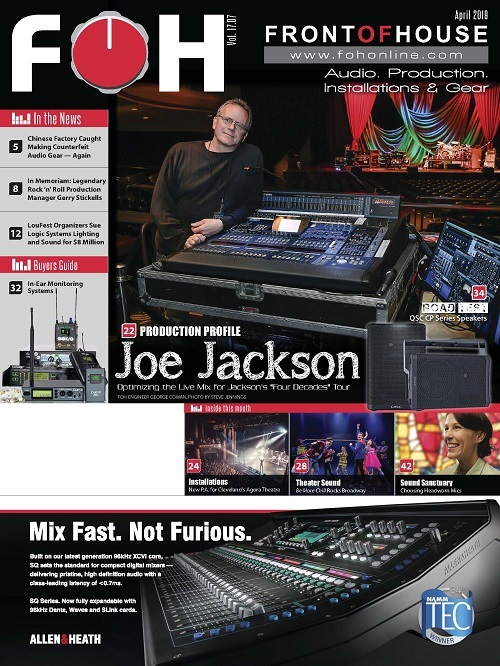 Designed for the hybrid production environment, Fusion offers Vintage Drive (non-linear harmonic enhancement), Violet EQ (minimum phase-shift, two-band shelving EQ), HF Compressor (harshness reduction with tape-like HF rolloff), Stereo Image (true analog Mid-Side spatial manipulation) and a custom-designed SSL transformer circuit. Steinberg’s (www.steinberg.net) Nuendo Live 2 software is designed to deliver reliability and performance for live recordings and premium multi-track live recordings. Combining intuitive use and solid stability with outstanding audio quality, it seamlessly integrates with Yamaha CL and QL Series digital consoles. Meter View, a new feature, allows users to oversee all recording levels over the entire display, showing from 32 to 160 meters at once. 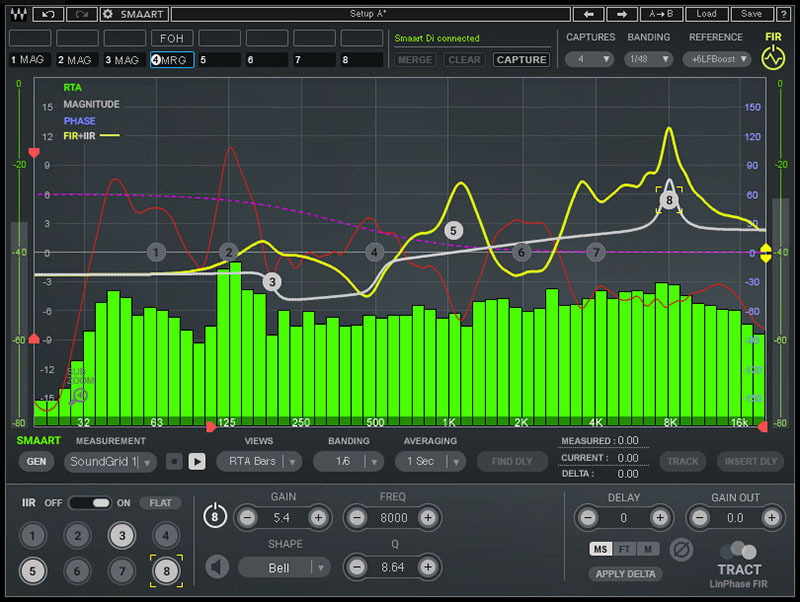 Waves’ (waves.com) TRACT plug-in integrates with Rational Acoustics’ Smaart v8 and Smaart Di v2 for sound system tuning. 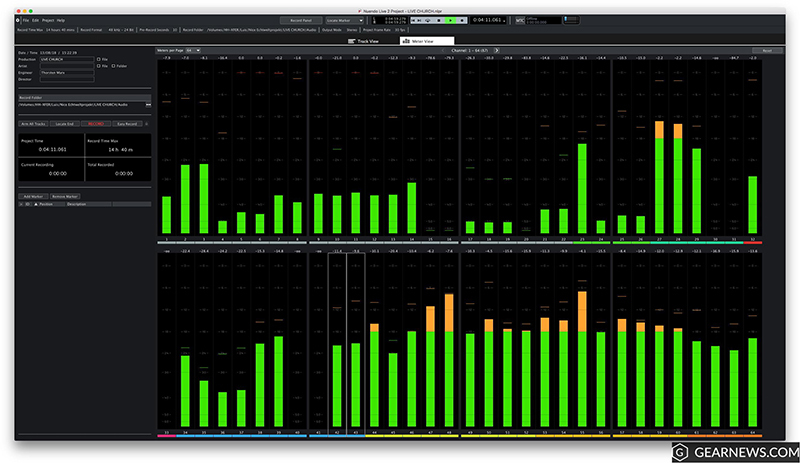 Using data collected by Smaart, TRACT calculates and generates a corrective FIR EQ curve and time alignment corrections across as many as eight audio snapshots — all of which can be manipulated via tweakable parameters or using up to eight bands of IIR EQ filters. IIR filter shapes include: bell, low/high shelf, flat-top, Butterworth and Linkwitz-Riley curves, a Tilt EQ with a variable frequency pivot point, and an all-pass filter. Stay tuned for a full Road Test from FRONT of HOUSE. 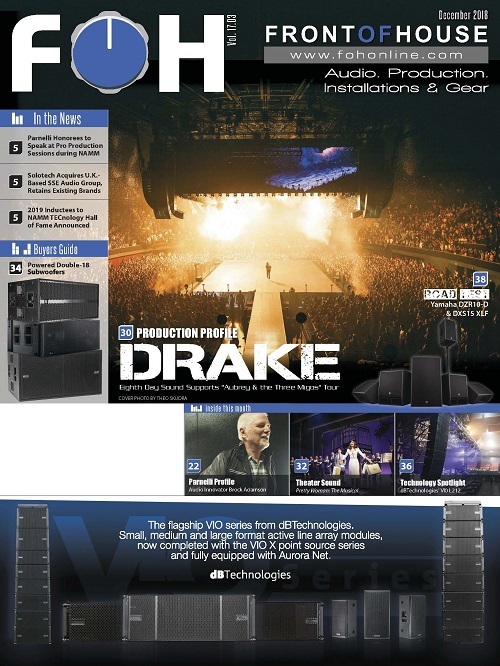 Yamaha (www.yamahaproaudio.com) featured its new lines of powered (DZR/DXS-XLF) and passive (CZR/CXS-XLF) speakers and subs. Active models have 96k Hz DSP and FIR-X tuning and 2-channel Dante integration. All feature plywood cabinets with flypoints for eyebolts and U-brackets for flying and hanging. 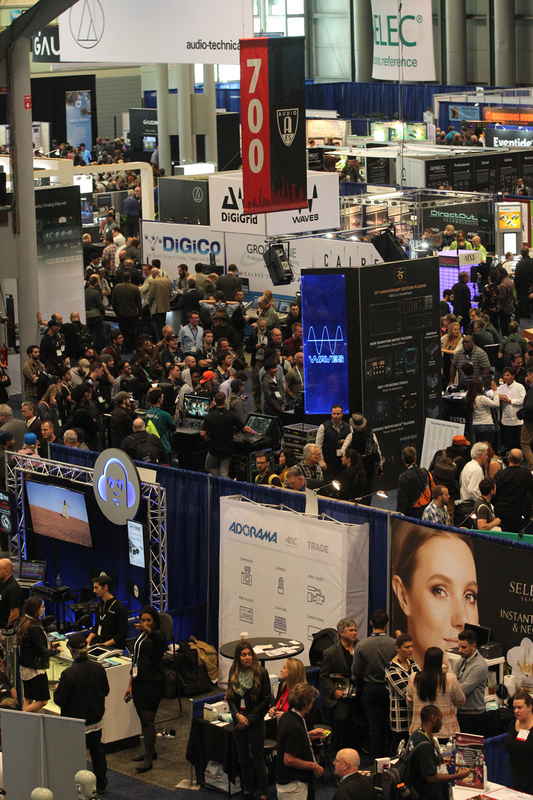 As you’d expect, there were tons of other announcements at AES, so stay tuned for more — and remember that AES returns to New York for its 147th Convention, October 16-19, 2019. See you there! Steve “Woody” La Cerra is the tour manager and front of house engineer for Blue Öyster Cult. He can be reached via email at Woody@fohonline.com. The Live Design International (LDI) expo returned to the Las Vegas Convention Center from October 15-21, 2018, with exhibits on October 19-21, kicking off the 30th anniversary of the annual event, which has been held since 1988. 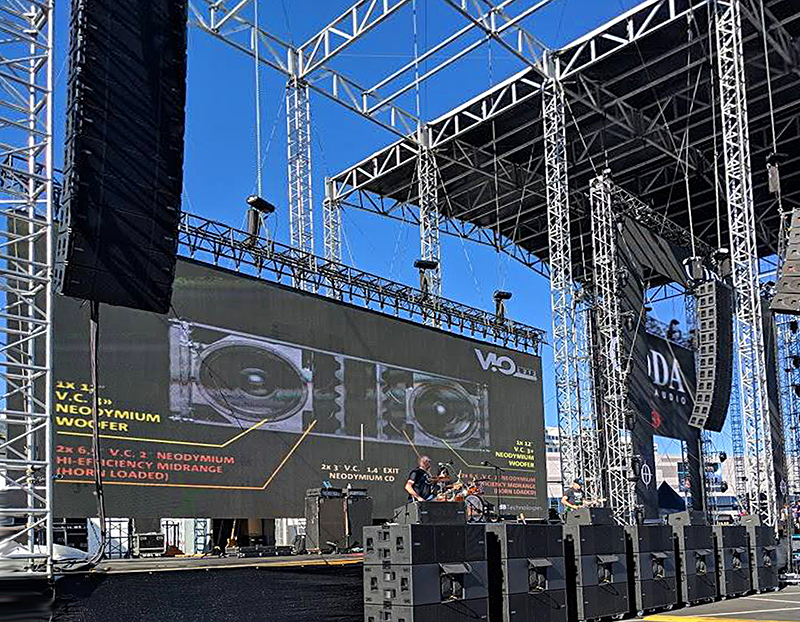 For the third year, LDI hosted “Live Outside,” with four stages set up in the parking lot that featured ongoing outdoor demos by speaker suppliers CODA, dB Technologies, E-V and RCF. The expo’s main focus is on lighting and display technology, but a small contingent of audio companies were on hand with new products. Here are a few that caught our eyes — and ears. 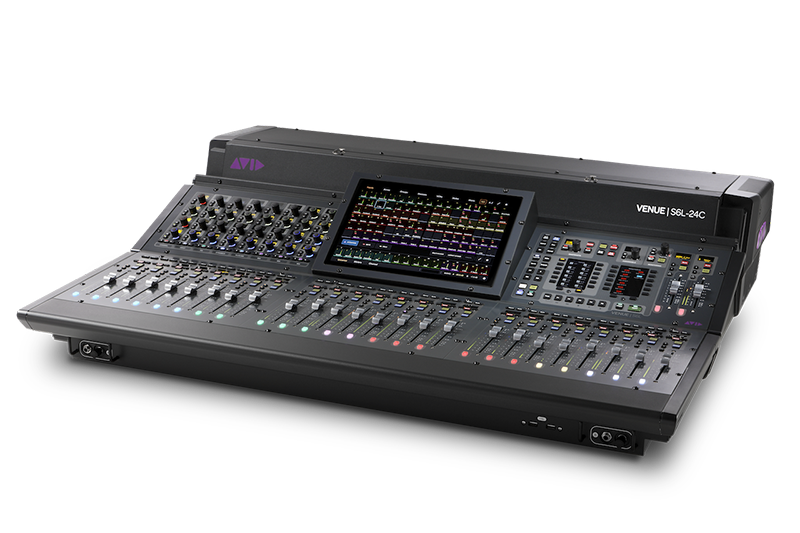 dB Technologies (dbtechnologies.com) brought its VIO L212 — the largest member of its VIO Series to LDI Live Outside — for its official U.S. launch. 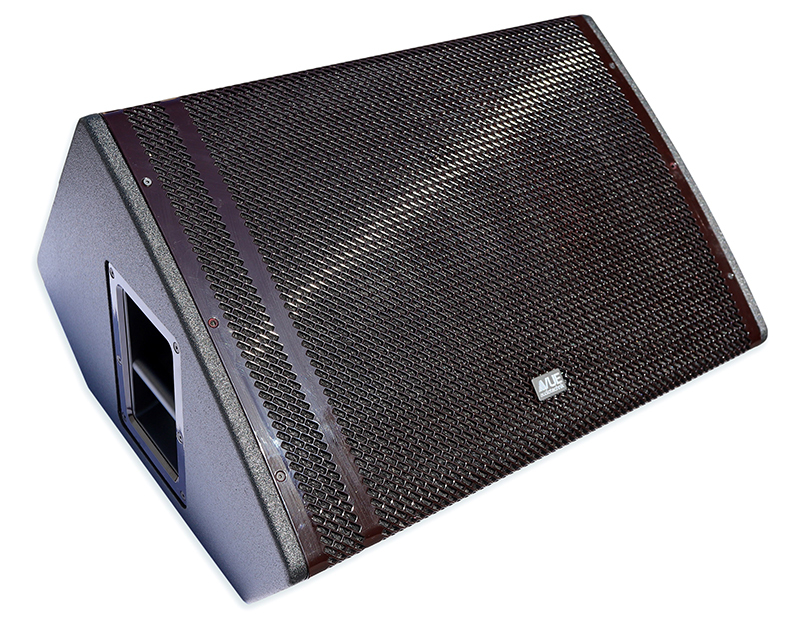 This large-format line array is a three-way active system with dual 12” woofers placed in a dipolar arrangement, paired with a horn-loaded midrange and a cylindrical HF wavefront designed for optimal directivity control. Weight is just 120 pounds and it shares the same Aurora Net flexibility and three-point rigging system of other VIO family members. VUE Audiotechnik (vueaudio.com) is shipping its hm-115 high definition stage monitors. Slotting between the hm-112 and hm-212 in output and size, the single-15 hm-115 is intended for those requiring a compact design with LF extension. Features include: a neodymium HF comp driver with beryllium diaphragm; integration with VUE’s V4 Systems Engine (providing DSP, networking and amplification in a rack unit); and a low-profile, birch ply enclosure. Whirlwind (whirlwindusa.com) showed its Rack Lightning™ — a rack rail lighting system that can illuminate your equipment rack in six different color settings, with an adjustable dimming control. An expansion to Whirlwind’s Power Link line of power distribution products, the Rack Lightning system is designed to get users out of the dark ages and into the light. The system is available as a rack rail version, or as a single space overhead unit.